I simply love day trips. There is nothing more cathartic than packing up the car and clearing your head space with a new view. Let's face it though, even day-tripping can get expensive, but with a little intentional planning, you can satisfy your travel bug without breaking the bank. As we kick off our coverage on inexpensive road trips, we are covering our favorite North Carolina day trips. For those in the Southeast, The Tar Heel State boasts several great day trip options with anything from the mountains, to the city, to white sandy beaches. Whatever your desired destination, chances are they have it. I’m a little biased when it comes to this first destination, but hey, I couldn’t write an article about North Carolina day trips without including my favorite place on earth and hometown, Charlotte. They don’t call it the Queen City for nothing, Charlotte has everything and more. Amelie’s French Bakery took the city by storm and it wouldn’t be a trip without testing out the world famous Salted Caramel Brownie. There are several locations dotted around Charlotte, but the original in the super trendy NoDa area is 24-hours and practically a rite of passage for visiting. My personal favorite? The lavender iced coffee. Charlotte has a lot of amazing street art, but the Firebird installation in front of the Becthler MoMa is incredible. The Becthler and the Mint Museum of Art are right across the block from each other in what is called the Levine Center for Arts. Wednesday nights at the Mint are free from 5-9pm! Not matter how much they break my heart, the Carolina Panthers are my hometown team. Charlotte features several professional teams, however if you’re looking for a day at the ballpark for a reasonable price, look no further than a Charlotte Knights game. BB&T Ballpark is in the heart of Uptown Charlotte and directly across from Romare Bearden Park. The games are fun, tickets are cheap, and with the city skyline as a backdrop, there is no better place to be on a warm evening. Charlotte is often called the city in the trees and for good reason, the city is surrounded by lush agriculture and plenty of parks. My personal favorite is Freedom Park, also very close to Uptown. Think mini-Central Park. Word of Advice: Public transit really isn’t a thing, and the bus schedules can be tricky to figure out. However, Lyft is a great option, and Uptown is very, very walkable. Only a short drive from Charlotte, skip the crowds at popular beaches like Myrtle and opt for Wrightsville. This beach is very near and dear to my heart, and some of my favorite childhood memories were formed here. It’s quaint and no fuss with gorgeous waterfront views and sunsets that will take your breath away. The only problem is you won’t want to leave! I like my coffee with an ocean view, and if you do too then you’ll love SUNdays Surf Cafe. Awesome iced coffee paired with a selection of local treats, perched right above an oceanfront surf shop. Walk across the way to the Oceanic Crystal Pier for an incredible view to enjoy with your coffee. If you’re craving something a little more substantial, then go back to the mainland for some of the best burritos at Flaming Amy’s in Wilmington. Though you’ll be inspired by the breathtaking views of the ocean and ornate seashells dotted across the pure white sandy shoreline, go back to Wilmington for your art fix. The Wilmington Riverwalk is a short drive from Wrightsville, and boasts several galleries and shops featuring work by local artists. Okay, so you really don’t go to Wrightsville to see a game. 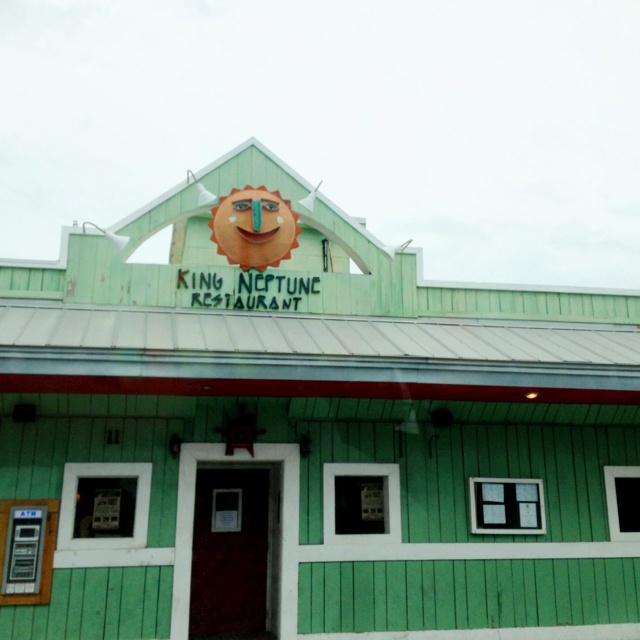 However, if you need a good place to catch a game back home, look no further than King Neptune’s. King Neptune’s has been a family favorite ever since my parents visited on their honeymoon nearly 30 years ago. They have a wide selection of favorites on their menu (including Taco Tuesday!) and can serve anything from a great Arnold Palmer to your favorite mixed drink at the bar. A local legend, it’s easily accessible on Lumina Ave in the heart of Wrightsville. With every type of water sport imaginable, the oceanfront of Wrightsville is an outdoor lover’s paradise. Speaking from personal experience, the waves are great for surfing and bodyboarding, and the sands are perfect for a game of volleyball. Just make sure to wear your sunscreen, that Southern sun doesn’t mess around! Some say that Asheville is overrated and I think that’s just because more and more people are experiencing the niche vibe of Asheville. It’s hip yet down to earth with the beauty of the mountains and the diversity of a big city. There is so much to do, but it makes the perfect getaway without breaking the bank - unless you hit up Biltmore Estate of course. It’s nearly impossible to narrow down the food possibilities in a town like Asheville, but if you’re craving great brunch food then Tupelo Honey Cafe is the place to be (or bee?). If dessert and coffee are more your style, then French Broad Chocolate Lounge will be your heaven. The handcrafted truffles and other delectable treats will be well worth the wait! My family once walked all over Asheville popping into various galleries as we went. It’s easy to spend a day walking about, enjoying all of the local art Asheville has to offer. In addition to the local art displayed in downtown Asheville, the Asheville Art Museum has an impressive collection if you prefer to stay indoors. Much like Wrightsville, you really don’t go to Asheville to catch a game. However, there are several universities nearby, such as App State, where you can see some college games if you’re visiting at a time when the leaves turn! Asheville is nestled into the Blue Ridge Mountains and even if you aren’t up there in the fall, the views are spectacular. However, if you plan on going in the fall, visit Triple Falls in the Dupont National Forest for great hiking and picturesque foliage. I encourage you to go early, and bring proper hiking shoes as I personally have slipped into the falls as a result of poor planning.